Ste. 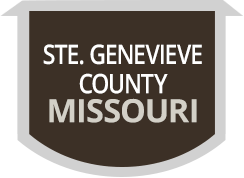 Genevieve County is located on the west bank of the Mississippi approximately 60 miles (97 km) south of St. Louis. Ste. Genevieve is the principal town and the county seat of Ste. Genevieve County with a population of around 5,000 people. Ste. Genevieve was the first permanent civilized settlement in Missouri. Ste. Genevieve is approximately 250 years old. The seat of government was established in New Orleans, and what is now Missouri became part of Upper Louisiana Territory. The early French explorers and settlers were known to have been in the Ste. Genevieve area in the very early 1700s.